Spread the Love by giving your special person a gift certificate. They will love the experience of designing their very own bespoke piece to cherish. A Love Letters Gift Certificate is perfect if you are combining with family, friends or colleagues to buy a higher value gift. Certificates start from $50.00 and can easily be redeemed by contacting me to arrange their unique piece. I offer complimentary postage for certificates ether directly to you or to the recipient of your gift, simply let me know where and when to send it. 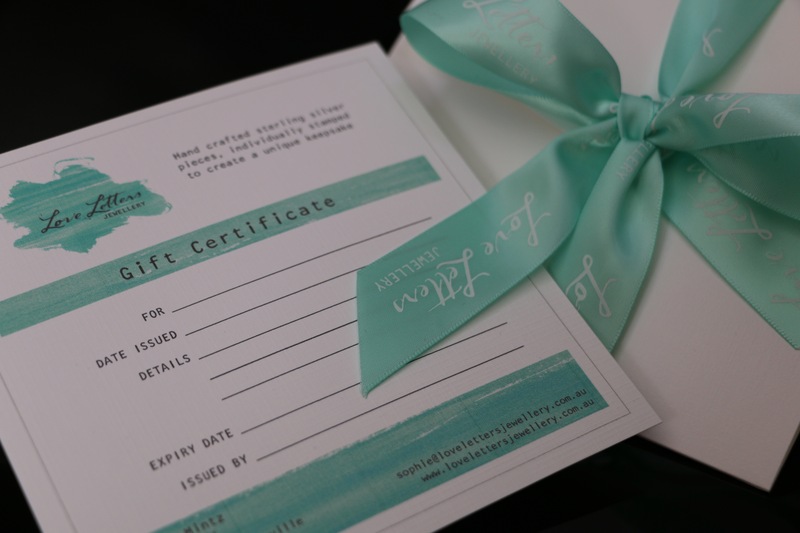 Love Letters Gift Certificates come beautifully presented printed on premium paper wrapped in a designer pouch with signature Love Letters ribbons. Please Note: Love Letters Git Certificates are not redeemable for cash, non refundable and must be used within 12 months from date of purchase.